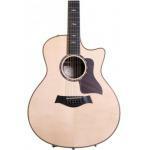 The Taylor 856ce is an acoustic-electric 12-string guitar that's primed for brawny, full-voiced tone. That's because not only is it constructed with premier tonewoods - there are a solid Sitka spruce top, an Indian rosewood body, and a Tropical mahogany neck. You'll hear a richer voice, with more complex harmonics and a more open sound that's incredibly vibrant. The secret is that Taylor optimized the wood thickness and bracing patterns to give you the best that the Grand Symphony design has to offer - powerful lows, crisp highs, and exceptional balance across the entire spectrum. Even unplugged, the 856ce gives you a surprising amount of natural projection, and thanks to its onboard Taylor Expression System 2 electronics, it also sounds fantastic when you plug in. Take it from Sweetwater - you'll love the Taylor 856ce 12-string acoustic-electric guitar. 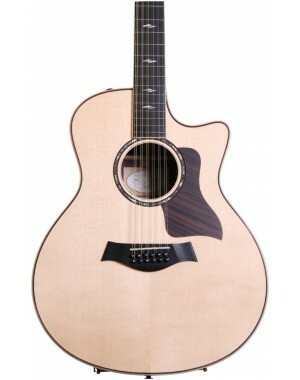 Taylor's 856ce is designed to make the most of the beautiful 12-string sound, thanks to its Grand Symphony body style. You'll enjoy excellent articulation, but enhanced projection - it's a perfect guitar for laying down tracks in the studio, but it's also a great choice onstage. As far as tonewoods, the Taylor 856ce features a solid Sitka spruce top alongside an Indian rosewood body. The neck comprises beautiful Tropical mahogany that opposes a smooth black ebony fingerboard. And, a carefully carved Venetian cutaway gives you comfortable access to the 856ce's upper frets. You'll notice that the Taylor 856ce boasts exceptionally vibrant tones with a unique character. Taylor went back to the drawing board and redesigned their bracing patterns, to get the optimum response out of each of their iconic body shapes. Taylor even added side bracing to add rigidity to the sides and enhance top and back movement. In the words of luthier Andy Powers, the updated Advanced Performance bracing pattern gives the updated 856ce a "nice, cushy swell and long sustain, even with a delicate touch." One of the things we like best about Taylor at Sweetwater is that their various body styles are designed for specific purposes, allowing you to choose a guitar that's the perfect match for your style. With the 856ce, Taylor takes that to another level by carefully matching the thickness of the spruce top and rosewood back and sides to the body style. They determined what the optimum wood thickness for the 856ce's Grand Symphony body would be, to give you maximum tone and light weight while also being equally strong. Taylor is also using real animal protein glue (fish, in fact) instead of synthetic glue. Luthiers have been using protein glues for centuries for their incredible strength, and also for their tone. Protein glue optimizes transfer of vibrations and also holds amazingly well, which means you're sure to get a lifetime of fantastic tone from the Taylor 856ce 12-string acoustic guitar. Traditionally, acoustic-electric guitars have employed under-saddle piezo transducers, but Taylor has discovered a better way. Their revolutionary Expression System 2 uses a proprietary pickup behind the saddle. The pickup's three individually calibrated, precisely positioned piezo-electric sensors respond organically to the instrument's acoustic energy as it's transferred through the saddle. In concert with Taylor's custom-designed preamp (which delivers a 25% hotter signal), the result is a more natural acoustic sound with incredible dynamic range and responsiveness to your pick or finger attack. Sweetwater's guitar gurus are mightily impressed with Taylor's Expression System 2. Whether you're onstage through a PA, plugged into an acoustic amp, or direct into recording software, the ES2 faithfully conveys the voice of a Taylor guitar. Taylor's 856ce features a Grand Symphony body and choice tonewoods - it's designed to project premium 12-string acoustic tone! may i have more picture please? Dear sir,we will send you email,please check.thanks. Please send me more picture of this guitar! I will send you an email timely..